Matt Hancock, the Minister of State for Digital and Culture Policy, has applauded the University of Southampton’s Future Worlds startup incubator for its presence at the forefront of UK startup technologies at the recent Consumer Electronics Show (CES) in Las Vegas. 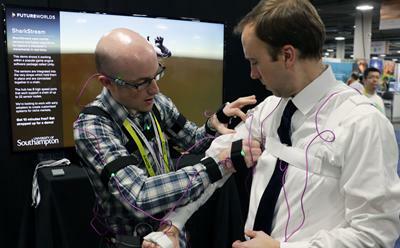 The Minister highlighted the incubator as one of the UK’s leading lights at the international trade show and took a hands-on approach in a special visit to Future Worlds’ stand, animating a live character in a University-designed motion capture suit. Future Worlds was the only UK university exhibitor at CES for a second year running as it showcased over 20 startups and spinouts that have developed over the past year in its unique entrepreneurial ecosystem. Since its launch in 2015, Future Worlds has been helping University innovators on every step of their journey through mentoring, events and its web platform. Mr Hancock was promoting British tech businesses at CES and visited the Future Worlds stand at Eureka Park in Las Vegas. He was transformed into a soldier during a live demonstration of the SharkStream motion capture system and experienced 3D audio through the Sound Virtualiser soundbar, a technology he commented as being “incredible”. Many of these technologies, and Future Worlds itself have been supported by government funding through the Engineering and Physical Sciences Research Council (EPSRC) Impact Acceleration Account. Throughout CES 2017, Dr Wilcock has written an engaging blog covering the action-packed four days, with the Future Worlds team uploading coverage daily to the platform’s YouTube channel. All of the startups featured at CES are profiled at www.futureworlds.com/section/discover.